This salad always reminds me of summertime! It happens to be one of my dad's favorite so I remember my mom making this for nearly all of our summer barbecues. I remember my mom originally making this with equal parts white vinegar and apple cider vinegar plus sugar but for my recipe I only used apple cider vinegar and omitted the sugar. However, you can play around with ingredients to fit to your liking! It is such a easy salad to put together that you can have as a snack or throw on a salad or sandwich. I love throwing this on top of mixed greens with green peppers, feta, and olives for a variation of a Greek salad (pictured below). 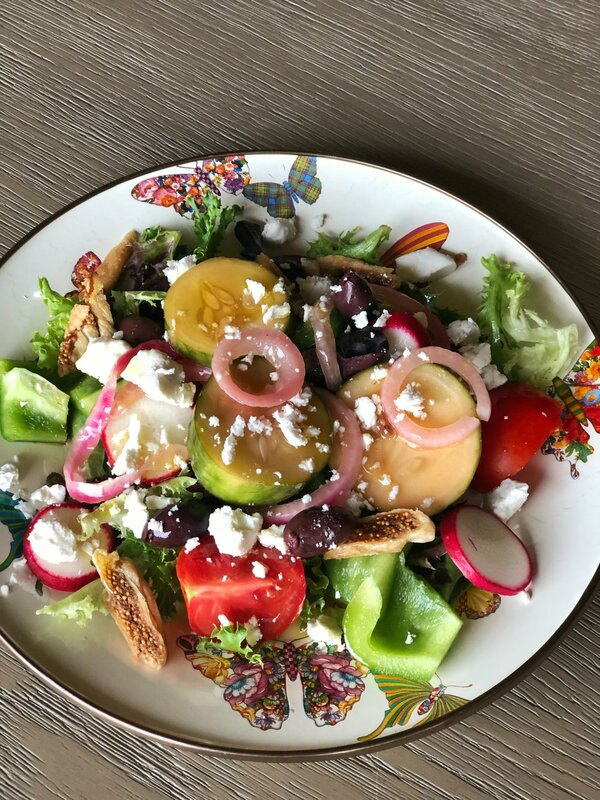 I love making large salads like these and having on hand throughout the week. A large part of my 70/30 Plan is creating versatile meals that can last 3-4 days so you have healthy options readily available. I love making foods that you can use a variety of different ways as it helps maintain a healthy diet for busy schedules. Take for instance my Oven Roasted Chicken recipe. From this, you have the chicken to use in recipes throughout the week (like this Waldorf Chicken Salad) as well as the chicken carcass to make a nourishing broth that helps support gut health and use this in various base soups recipes. Check out a few of my other favorite salads for meal prep like my Carrot, Kale & Raisin Salad, Broccoli Cauliflower Salad, Superfood Quinoa Salad, and my Spring Spinach Salad. These kinds of salads are excellent to have on hand because they work well for any meal of the day or just nice to have when you need a snack. You can throw in with mixed greens for an easy salad or along side chicken or even is great as-is! Combine all ingredients into a bowl and mix well. Refrigerate for about 24 hours and enjoy!